We talk a great deal about exports of goods, however, private services-producing industries have become an increasingly important share of the U.S. economy, rising from 48 percent of GDP in 1947 to nearly 69 percent in 2010. The largest growth sector over this period have been the finance, insurance, and real estate (FIRE) sector which rose from nearly 11 percent of GDP in 1947 to more than 21 percent in 2010. Professional and business services have also risen from just 3 percent of GDP in 1947 to more than 12 percent of GDP in 2010. 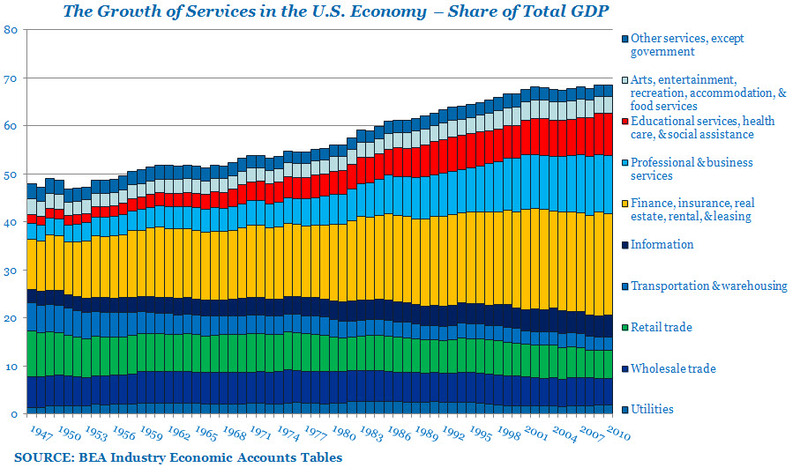 Services Trends as a Percent of GDP: 1947-2010. From 1947 to 2010, the services sector’s share of GDP has risen from 48 percent to nearly 69 percent. Indeed, the casual observer wouldn’t be inaccurate in concluding that the U.S. is a post-industrial, services based economy. However, it’s only relatively recently that services have become an important source of export growth as well as these services that are integral to the U.S. economy are increasingly sought out by foreign buyers overseas. In the October 2011 Survey of Current Business, the Bureau of Economic Analysis has released the latest data for services in their article “U.S. International Services: Cross-Border Trade in 2010 and Services Supplied through Affiliates in 2009.” This report shows that in 2010, the U.S. sold a record $530.3 billion in services to the world, up 8.7 percent from the $487.9 billion exported in 2009. 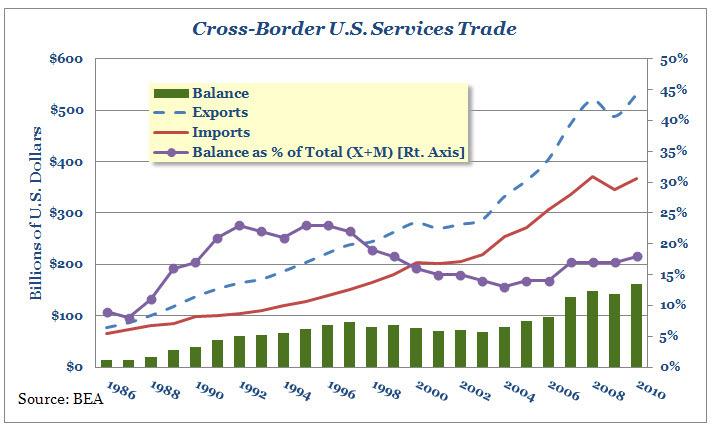 In fact, as shown in the chart to the left, the U.S. is running a significant surplus in services trade. While the U.S. exported $530.3 billion in services in 2010, U.S. services imports totaled only $368.0 billion, causing the U.S. trade surplus in services to total $162.2 billion. When comparing these services numbers and trends with the U.S. deficit on trade in goods (which climbed to $645.9 billion in 2010), the United States has consistently generated a surplus in services trade, a noteworthy detail for those businesses that want to grow their service opportunities outside the United States. The latest presentation on U.S. Trade in Services prepared by the Office of Trade and Industry Information is on our website.